Mexico is now facing its own Standing Rock-like moment as the Yaqui Tribe challenges Sempra Energy’s Agua Prieta pipeline between Arizona and the Mexican state of Senora. 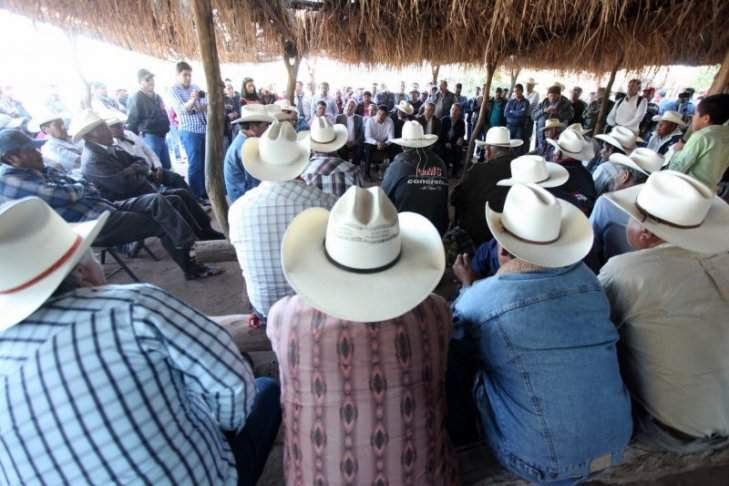 The Yaquis in the village of Loma de Bacum claim that the Mexican government has failed to consult with them adequately, as required by Mexican law. It was a similar lack of indigenous consultation which the Standing Rock Sioux Tribe said was the impetus for lawsuits and the months-long uprising against the Dakota Access pipeline near the tribe’s reservation in Cannon Ball, North Dakota, in late 2016. Now, according to Bloomberg and Mexican reporter Gema Villela Valenzuela for the Spanish language publication Cimacnoticias, history is repeating itself in the village of Loma de Bacum in northwest Mexico. Agua Prieta, slated to cross the Yaqui River, was given the OK by seven of eight Yaqui tribal communities. But the Yaquis based in Loma de Bacum have come out against the pipeline passing through their land, even going as far as chopping out a 25 foot section of pipe built across it. As the legal case plays out in the Supreme Court of Justice in Mexico, disagreements over the pipeline and its construction in Loma de Bacum have torn the community apart and even led to violence, according to Cimacnoticias. Construction of the pipeline “has generated violence ranging from clashes between the community members themselves, to threats to Yaqui leaders and women of the same ethnic group, defenders of the Human Rights of indigenous peoples and of the land,” reported Cimacnoticias, according to a Spanish-to-English translation of its October 2016 story. As it turned out, the Calico Complex Herd Management Area AND Sheldon Wildlife Refuge were the shortest and most expedient route for the pipeline. Advocates and journalists did a lot of digging. Ruby Pipeline LLC, a joint venture of El Paso Corp. (EP) and Global Infrastructure Partners, is among issuers planning to sell at least $4.78 billion of bonds in the U.S., according to data compiled by Bloomberg. UNION NATIONAL BANK PJSC, the lender majority-owned by Abu Dhabi Investment Council, may sell 5-year notes in a benchmark offering, according to a person familiar with the transaction who declined to be identified because terms aren’t set. The notes may yield about 287.5 basis points over the mid-swaps rate, the person said. The Ruby Pipeline is now online, scheduled to begin extracting (fracking) natural gas from around Opal, Wyoming and transporting to Malin, OR. There are also possilbe plans there for connections to the proposed Pacific Connector pipeline to export the Rocky Mt. natural gas to Asian markets, thus driving up the price for CA consumers. This is the same El Paso natural gas corporation that jacked up the prices during the ENRON energy “crisis” where inflated natural gas prices nearly bankrupt the state and caused rolling blackouts. BTW – As a Great Basin activist i must admit to having dropped the ball on this Ruby Pipeline project, we (me) didn’t have enough time to organize an effective opposition and thus was left writing a long report detailing the reasons why i am against this pipeline. The environmentalists and indigenous Native Americans (Paiute) who were most outspoken against the pipeline were NOT given adequate options for public comment! There was one meeting in SLC and none in Nevada from what i am aware, and the Ruby Pipeline crosses the entire state of NV!!! It is unfair to force such an intrusive project across the nearly pristine sagelands of northern Nevada without giving a chance for public comment. The reason that public comment was avoided was that usually giving enough time for local opposition presents a challenge to a natural gas corporation such as El Paso that is only interested in short term profit at the expense of the regions being fracked and the regions fragmented by 600 mile long pipelines. “The Jordan Cove liquefied natural gas proposal could be the riskiest energy project Southern Oregon has ever seen. Originally billed as a necessary effort to import energy, the corporations backing the proposal recently have admitted that they plan to export U.S. gas overseas. Don was a senior economist with the Army Corps of Engineers and revealed through PEER that the agency had been falsifying cost-benefit numbers to justify a multi-billion dollar project: replacing and expanding all of the locks & dams on the Mississippi from St. Louis north. An official investigation verified his charges, leading to the dismissal of two generals and a colonel. The ensuing controversy prevented Congressional approval of any new Corps projects for the next six years while “Corps reform” was debated. Through PEER legal representation, Don ended his Corps career teaching transportation economics at the University of Missouri, where he now is a full tenured professor. The story of Don Sweeney, a whistleblower who put a stop to waste and fraud at the U.S. Army Corps of Engineers.